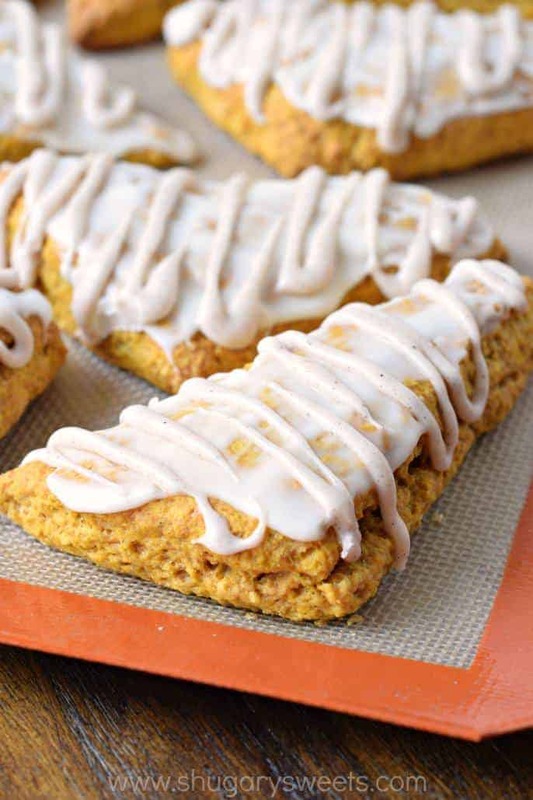 If you love Starbuck’s Pumpkin Scones, you’ve got to give this copycat recipe a try! The double glaze gives them the sweetness they need! I have never made scones before yesterday. I’ve eaten them, but never attempted to bake them before. Now that I have, my life will never be the same. Last week I bought a pumpkin scone from Starbucks, it was amazing. I knew I had to have these in my life, and soon. The scone itself is so moist, not overly dry and crumbly like some I have eaten before. Then you brush on the vanilla glaze and it takes the sweetness up a notch. You go one step over the top by adding a second glaze, drizzled over the scone. In small bowl, mix the pumpkin, heavy cream and egg with a whisk. Set aside. In mixer, using paddle attachment, mix flour, sugar, baking powder, baking soda, and spices. Add in cold butter cubes and mix until crumbly. Slowly add in pumpkin mixture and mix until thoroughly combined. Dough will be crumbly, so you'll need to mix with hands. if it's too sticky, add about 1/4 cup flour until you can manage it easily. Divide dough in half, and form the dough into a 12x6 inch rectangle. If it’s too sticky, using hands, mix in enough flour so it is easier to shape. I sprinkle my silpat (or counter) with about 1/4-1/2 cup flour). Cut dough into triangles by making three vertical cuts (you should now have 3 rectangles. Cut each of the rectangles by making an X, I use a pizza cutter. Then make ONE horizontal cut across the center. You should have 18 triangles. Place each triangle onto a cookie sheet lined with parchment paper. Bake in a 425 degree oven for about 13-15 minutes. Repeat with other half of dough. Cool on rack. Make sugar glaze by whisking the sugar with heavy cream. Using a brush, paint the tops of each scone with the glaze. To make the cinnamon glaze, whisk all the ingredients together until smooth. Pour into a ziploc bag and cut the corner. Drizzle the glaze over all the scones. Allow to dry (about 15 minutes). Eat and enjoy! I think the instructions are missing something. My mistake–the order is not quite right–sorry–Can’t wait to try them. I love making scones. Here is a link to a Cinnamon Sugar Scone (Starbucks-like) recipe that I use a lot. I have “pinned” the pumpkin scones, and am looking forward to trying them. I love anything pumpkin…well probably not anything, but most things! These look great. I am pinning them now..yum! mmm! Love me some pumpkin! These look amazing! These look great! Pumpkin makes everything better. I am in love with the Starbuck’s pumpkin scone and have been wanting to make them for awhile. Thanks for the recipe! Wow these are absolutely gorgeous, can’t wait to try them. My husband requested scones this weekend too! But he wasn’t ready for a fall flavored one just yet:-) I am on a huge pumpkin kick right now so these are looking fabulous to me!!! What a perfect Fall treat! They look fantastic! I am a new follower from the Tuesday Time Out Hop. If you have a moment, come by http://www.messforless.net and say hi! 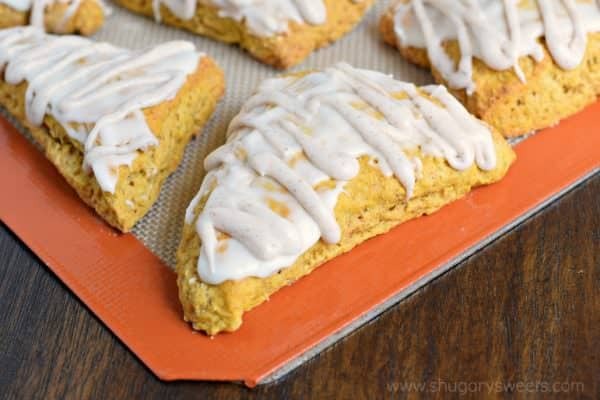 The pumpkin scones sound wonderful! Thanks for sharing and linking to TMTT. Oh you KNOW I will be making these!! YUMMO! Pumpkin is right up my alley and I’ve never made scones before either! Two glazes?? I’ll take that scone on the lower right, please. I’ve never made scones either! But you make it sound so easy, maybe I should try. Now that it’s fall, I find myself constantly craving pumpkin. Kimby- sorry, I ate it! OhKeeka- YOU CAN DO IT! They are so easy, I promise. Pumpkin anything is my fav. These look so wonderful. Come visit us today. We have an awseome apple recipe. Jill, these are so moist and flavorful. Especially with the sweet glazes on top. Yum. Wish I had some leftovers! WOW! These look sooooo good! These look soooooooo good! 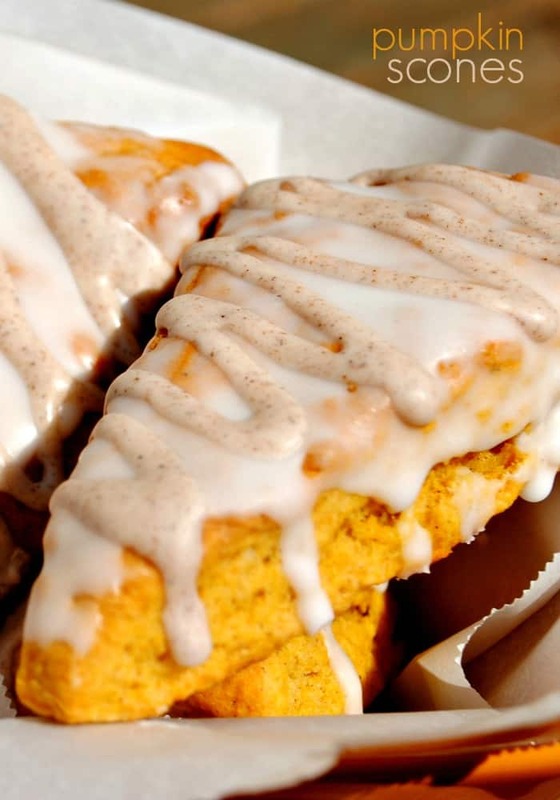 I love pumpkin scones. Would you link this up to my Fall Snack/Recipe Challenge? I know my readers would love to see! I want these and a cup of coffee…right now! These look fabulous! I’d love it if you would share them and any of your other great seasonal goodness tomorrow at our Seasonal Inspiration Saturday! I’ve never made scones either. Earlier this year, I declared to myself that this would be the year I learned to make scones. Well, it’s September…and no scones. I think it’s the rolling out the dough and cutting into triangles that holds me back. Silly. These look delicious and are inspiring me to keep my resolution. Thanks for sharing on Sweet Indulgences Sunday. Your scones look and sound heavenly! I’m featuring your post at this week’s “A Little Birdie Told Me…”! Such a GREAT idea! We are featuring you tomorrow at the start of a new What I Made Wednesday Linky Party @ Sweet Peas and Bumblebees! Come and grab a button and join in on the fun! Oh my goodness…do these look tasty! Does anyone else think there is too much baking powder in these? I made mine and i think next time i would use less. I make these regularly and haven’t had any problems with the amount of baking powder. I like my scones to be a little “fluffier” and crumbly instead of dense. You can certainly cut it down to 1Tbsp if desired! I was wondering if I should put the dough in the fridge before I cut them? I had to add a lot of extra flour because it was so sticky. You could totally add vanilla. I called it vanilla glaze cause it sounded better than white glaze, LOL. Can you make these the night before? Do they still taste as good the next day? i want to make this for a book club, but leave early in the morning so would have to make the night before. And If so what would be the best way to keep them fresh? 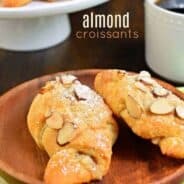 These look delicious.Same as you I have ate many scones.But never attempting making them myself.Just a quick question can you use milk in place of the heavy cream? I have everything but heavy cream. I made these this morning! Great. I do think the measurements for the white glaze and cinnamon glaze are reversed though. 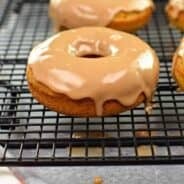 I came up with lots more of the cinammon glaze than the white. Great though. I always, ALWAYS get Pumpkin Scones at Starbucks!! I pop them in the microwave for a few seconds and wow!! So fun to have a recipe for these…yay! I love scones too!! These sound delicious! These turned out completely wonderful. Thank you! 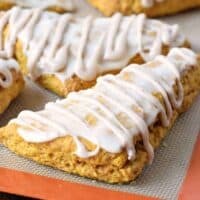 It’s the perfect way to use up the rest of a can of pumpkin after making coffee creamer… and yes, of course I had pumpkin coffee with the pumpkin scones! I’ve eaten way too many and they’ve only been out of the oven an hour. It says a can of pumpkin? How big of a can? Oh wow haha I cannot read! Nevermind! Just made these yesterday and they were OUTSTANDING. My entire family (even grumpy hubs who isn’t a fan of sweets) begged me to make these again. They were moist and perfect…..even better with my coffee the next morning! Thanks for posting! Whoohoo so glad you love them! Reminds me I need to make another batch ASAP. I think these were really flavorless. They had good consistency and looked pretty, but you could not tell that they were supposed to be pumpkin except by the color. Sorry. Can these be frozen? Too many for our family. Would you freeze them already baked, or freeze the dough and have it ready for the next batch? I’ve frozen them successfully after baking. The glaze gets a little soft and runny, but still tasty!! is nutritional information available for these scones? I’m on a strict diet and have to count everything! I don’t calculate it here…but I get there is an online website you can copy the recipe to get your numbers! Good luck! Can I make the dough two days ahead of time and then bake?? I made these last night for my kids to eat for breakfast this morning. Just sampled a corner. Wow, they are heavenly! The double glaze really does make a difference – don’t skip it. First pumpkin recipe of the season – welcome, autumn! As a baker with over 40 years of experience, I will make some suggestions. First, I would double the spice in the scones. Mine turned out relatively flavorless, and I followed the recipe well. Second, there was not enough liquid. I added about a half cup of pumpkin. I am not sure if the “heavy cream” they used was as heavy as mine. But I could not form mine into a ball. Either add liquid, or reduce the amount of flour. Third, I had trouble getting mine to cut evenly, following the instructions. They turned out to have wildly varying sizes and shapes. I patted my second half of the dough into a circle and cut in a pinwheel fashion. I added vanilla to the first glaze, as well. All that being said, I will still look for a different recipe. These were a disappointment for the trouble they were to make. I just made these and they were very good! I used Trader Joe’s pumpkin and it is thinner than Libby’s so it took more flour. They only took 10-11 minutes in my oven, so check them early! Next time I will use Libby’s pumpkin because all the extra flour made them a little too dry. Made last night and they are delicious! I mis-read the recipe and used an entire 15 oz can of pumpkin! Needless to say, they’re moist. Now I know why the dough was so difficult to work with. They’re not very attractive, but I’ll work on that next time. They’re are so perfectly pumpkin- flavored, I think I’ll make the same mistake next time! Thanks for the recipe! I just made these and substituted heavy cream with half and half. They are in oven and smell delicious!! Can’t wait try them with a cup of tea!! Easy recipe. Thank you for sharing!! This recipe is Amazing!! There is one thing I did different. I took the advice from a comment and added more a little more of each spice to make it taste more like Pumpkin. I did the same same with the icing. 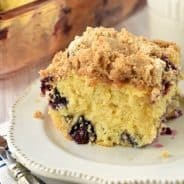 Awesome Recipe and definitely a keeper!! ☕️???? Would you suggest salted or unsalted butter?